It's Glam Time with this sparkly CHARM IT! Hello Kitty Beauty Queen charm. Sporting a beautiful glittery pink dress with black dots, Hello Kitty has a white enamel body, glittery pink heart hair bow, and mirror. Your Hello Kitty fan and CHARM IT! 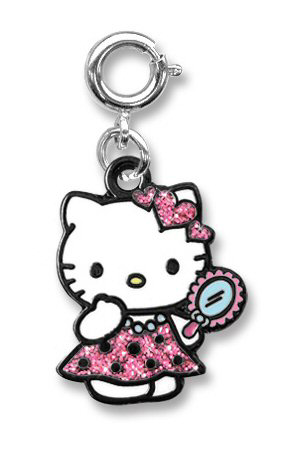 girl will love adding this Hello Kitty Beauty Queen charm to her charm jewelry. With a simple snap of a clasp, girls can personalize their CHARM IT! jewelry with this fun CHARM IT! Hello Kitty Beauty Queen charm.